The Porsche 911 GT3 was introduced in 1999 as a high performance version of the first water-cooled version of the Porsche 911, the 996. The GT3, named after the FIA GT class it was intended for, did not use the rather simple engine of the regular production versions of the 996, but a naturally-aspirated version of the turbocharged Porsche 962 and Porsche 911 GT1 race cars. Later, the turbo-charged Porsche 911 GT2 was added to the maker’s lineup, but unlike its predecessor 993 GT2, did not fit into GT racing regulations. The racing versions of the GT3 have won several major 24h races outright and mainly dominated their class at Le Mans. 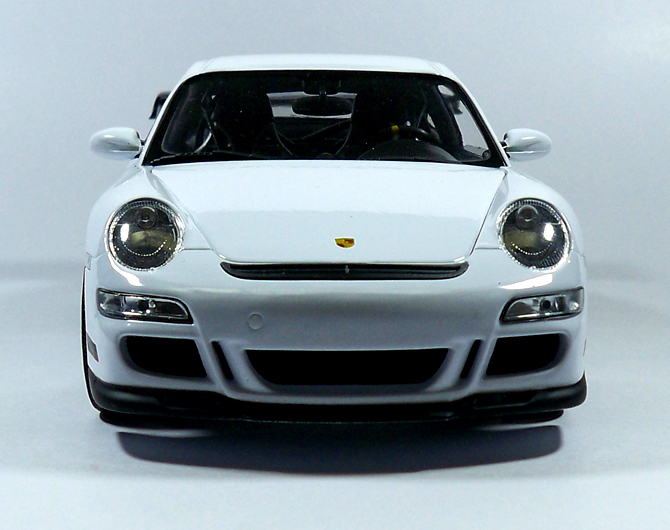 The 911 GT3 competes with the BMW M3 GTR and the Ferrari F430 GT2. 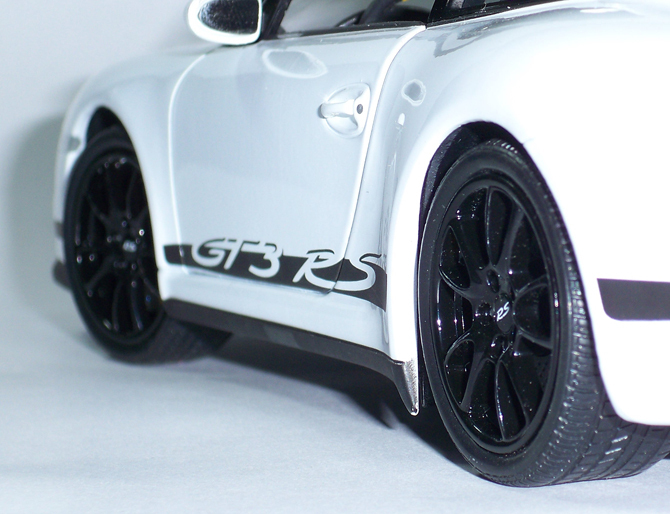 The RS stands for the “RennSport” in German which literally means “Racing Sport”. It is essentially a carryover of the Porsche 911 GT3, but it is lighter thanks to a polycarbonate rear window, carbon fiber hood and rear wing. Porsche Ceramic Composite Brake which are also more heat and fade resistant than the cast iron units fitted as standard. 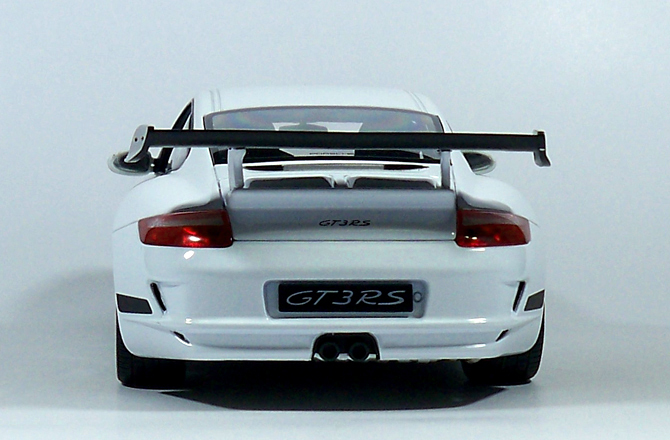 The RS has a slightly different engine specification to the GT3. The cylinder heads of the GT3 RS have reshaped intake and exhaust ports for race homologation. This very special guy comes in a standard box (welly should consider categorizing their product as regular, premium and special edition as maisto, hotwheels or even Autoart) as other model. This doesn’t look like anything special if stacked in a rack with other models, most of them are mistaken as regular model. But once out of the box this screems in your eyes “I am very special” with it exceptional paint finish, nice detailing like door handles, rear view mirror and those huge spoiler. 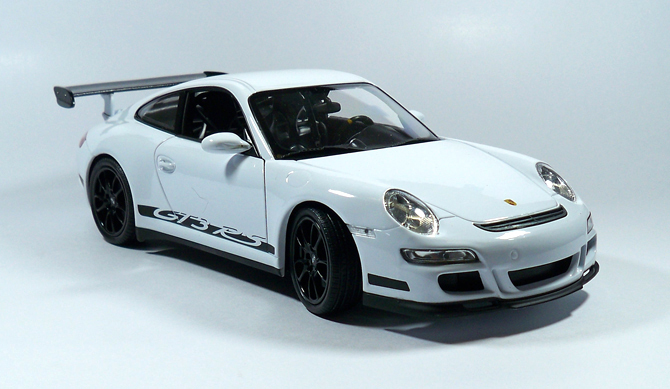 This particular model should be comparable with premium model such as hotwheels, autoart etc. because it is almost perfect in tearms of fit and finish and gap between the piecies etc. To conclude I should say Welly with this model has secured a place above Hotwheels and just below Autoart. Saran, this one is really well done by welly. I have this in the same color as your’s and this car made the heads turn for its white color and looks. 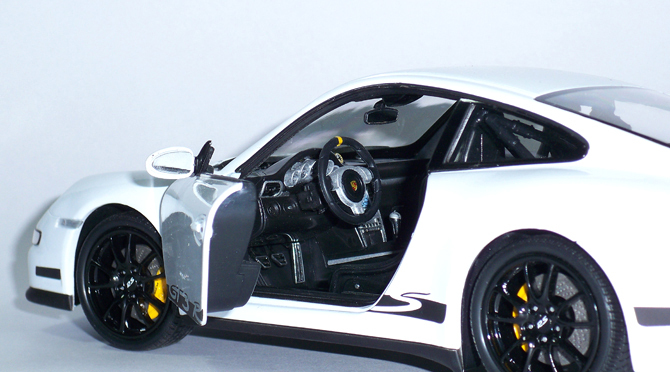 The detailing is awesome too saying it as a budget level model which most can afford and it is worth in a collection. NICE PHOTOGRAPHY. Errr……… I should say AMAZING. I agree with that you saying that it is like a AA. Even i did buy that from DCM. The moment i saw this one in there, without second thoughts made it mine. 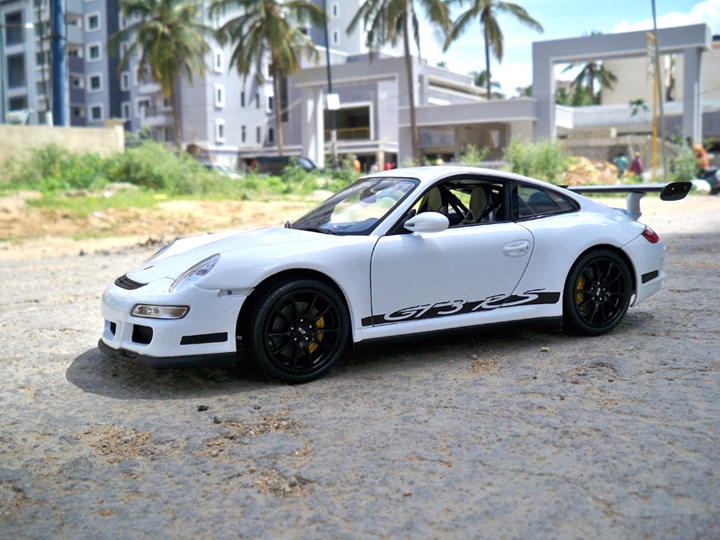 I was eagerly waiting for getting this in white only, after seeing Pratham’s GT3 in orange at our SMC forum. hw much did it cost…? Asaran is your friend a dealer in scale models?….if so can i get details to contact him?